The Mercedes-AMG GT 4-Door Coupe is already one of the best-looking four-doors around. But to celebrate its launch, Mercedes will offer an Edition 1 model with extra cosmetic upgrades inside and out to make it even more exclusive. This particular model features a grey paint job with sports stripes on the hood, across the doors, and on the roof and decklid. It also receives 21-inch AMG wheels painted in matte black. An AMG Aerodynamics package tacks on a larger front splitter and extra aero bits in the front bumper, a special diffuser, and fixed rear spoiler with a mechanically adjustable angle. Inside, you'll find Nappa leather upholstery with yellow contrast stitching and yellow seat belts. Also a whole new look with a sporty carbon fibre trim, performance bucket seats with a memory functionality, illuminated door sill panels, special AMG #63 cabin fragrance, and edition-specific floor mats. On the AMG performance steering wheel, there is a unique yellow marking and Edition badging. 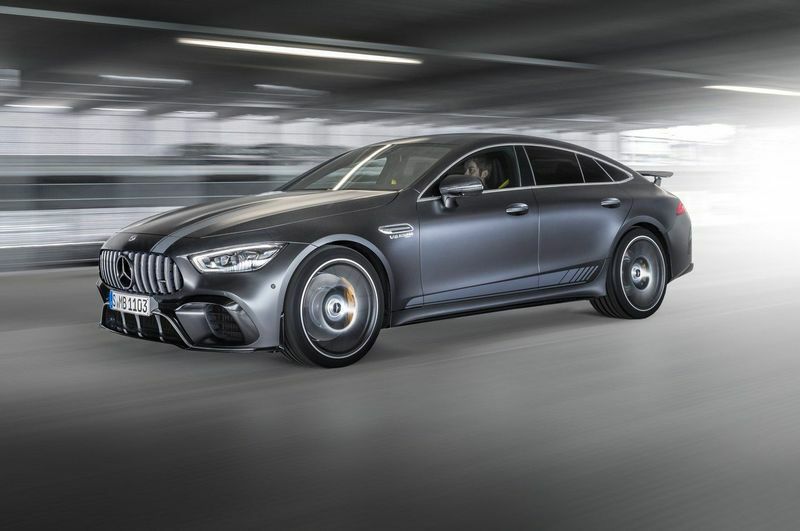 All Edition 1 models will come with the engine available on the top AMG GT 4-Door Coupe GT 63S. This unit is a 4.0-litre twin-turbo V8 that produces 630 hp, allowing it to hit 100km/h from standstill in just 3.1 seconds, according to Mercedes. Top speed should reach 250km/h with the electronic limiter. The AMG GT 4-Door arrives in early 2019 in the U.S and most parts of the world. The first models to go on sale are the GT 63 and 63S, while buyers going for the less powerful GT 53 will have to wait until the middle of 2019. Prices have not yet been announced. The Edition 1 will make its premiere in the sheet metal during the ADAC Zurich 24-Hour Race at the Nurburgring soon. Are you an AMG fan? Let us know your thoughts on the Edition 1 AMG GT. Video: 630bhp Mercedes-amg Gt 4-door Coupé Is Sublime!